Sports commentators were screaming on Norwegian radio early Thursday morning after two of Norway’s alpine skiing stars swept to victory in the men’s downhill at the Winter Olympics in South Korea. 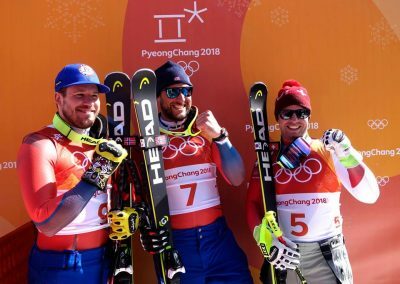 Aksel Lund Svindal’s gold medal made history again, while Kjetil Jansrud was delighted with his silver. Svindal never fails to impress, not only with his strength but with his winning smile as well. 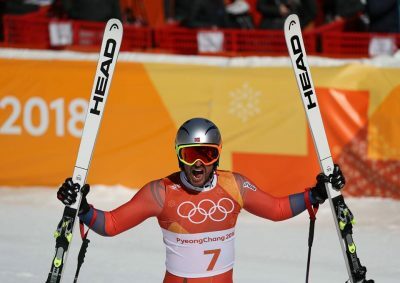 He quickly dubbed his latest victory, though, as “the beginning of the end.” At age 35, he said he’s often reminded that retirement looms for professional skiers and that he’s the oldest downhill racer to win the gold medal. “This is definitely my last Olympics,” Svindal told reporters after his latest achievement that was celebrated with Jansrud as well as his father and Norway’s Crown Prince Haakon among the spectators. He’s recovered from serious injury many times, still smiling, and this Olympic gold medal came after he’d been out for a year to make a brilliant comeback at the start of this season. “Historic” is a word attached to many acheivements at the Olympics. For Svindal, his new medal qualifies since it’s the first downhill gold for Norway. “I haven’t thought about being historic, I just wanted the gold,” Svindal said with a smile. He credited his ability to train a lot in February as a critical factor behind his victory, and both he and Jansrud literally applauded the support team that prepared their skis. He and Jansrud are also full of mutual admiration for one another, noting together that Svindal excelled at the end of the downhill course while Jansrud did best at the top of it. While he’a quite sure this is his last Olympics, Svindal was unsure about next season. “I don’t know,” he said, adding that he’d need to train more than he has during this comeback season, and will need to take a break this spring to assess the situation. Svindal’s gold didn’t break Norway out of third place in the medals race, though, with both Germany and the Netherlands topping the list with eight and five gold medals each. Norway’s total of 13 medals tied Germany’s, with the Netherlands and Canada next at 11.